The Russian-born singer with Greek roots has been on stage since she was four years old. She graduated with honors at the Rimsky-Korsakov St. Petersburg State Conservatory (Russian Federation) and completed her post graduate studies at the University of Music Franz Liszt Weimar (Germany). In the season 2015/16 Anna-Maria Kalesidis had her sensational debut as Abigaille in "Nabucco" at the Pforzheim Theater. This role also took her to the Würzburg Theater, the Ulm Theater and the Leipzig Opera, where she will also be heard this season. In 2016/17 she thrilled the audience as Rusalka at the Tiroler Landestheater Innsbruck, for which she was awarded the Austrian Music Theater Award for Best Female Lead. In the season 2017/18 she impressed as Katja Kabanova in the new production of the Freiburg Theater. In the previous years, the lyrical-dramatic soprano regularly performed in her hometown of St. Petersburg, e. g. as Musetta, Tatiana, Marfa, Iolanta, Contessa, Liù, Giulietta and Nedda. She also performed as Emma in „Chowanschtschina“ at the Nationaltheater Weimar, as Fiordiligi with the Philharmonic Orchestra Jena and in a multifaceted interpretation as Tatiana at the Staatstheater Oldenburg. She has given concerts in Armenia, Germany, China, Italy, Russia and Spain. 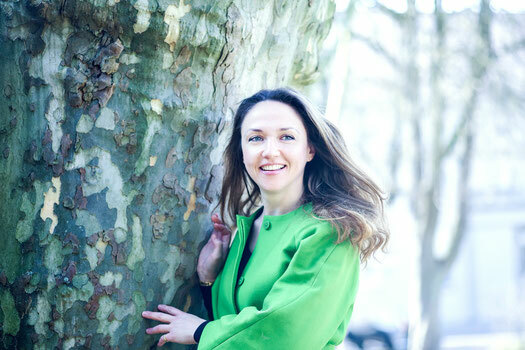 Her wide-ranging repertoire includes Wagner's „Wesendonck Songs“, Strauss's „Four Last Songs“, Berlioz's „Les nuits d’ete", as well as art songs and choral music. In the season 2018/19 Anna-Maria Kalesidis will perform at the Tiroler Landestheater Innsbruck as Micaëla in "Carmen", as Madeline Usher in "The Fall of the House of Usher" by Philip Glass.